2 more sleeps until Christmas!! 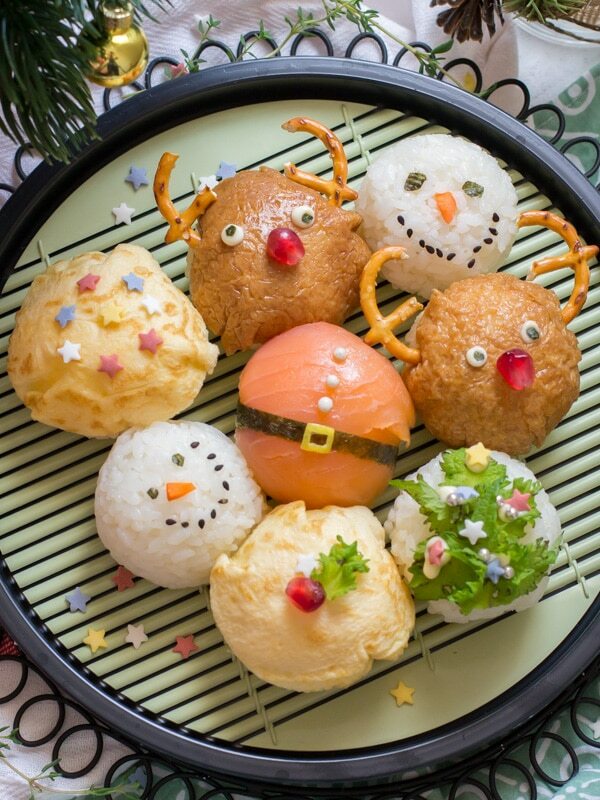 If you still don’t know what to make for the day, try out these Christmas sushi balls! They’re easy to make on the day without much prior preparation and are fun for the whole family to decorate, especially the kids! 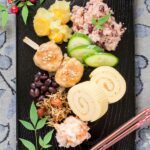 These cute little sushi balls put a fun little Japanese spin on your Christmas party and serve these to your friends and family! 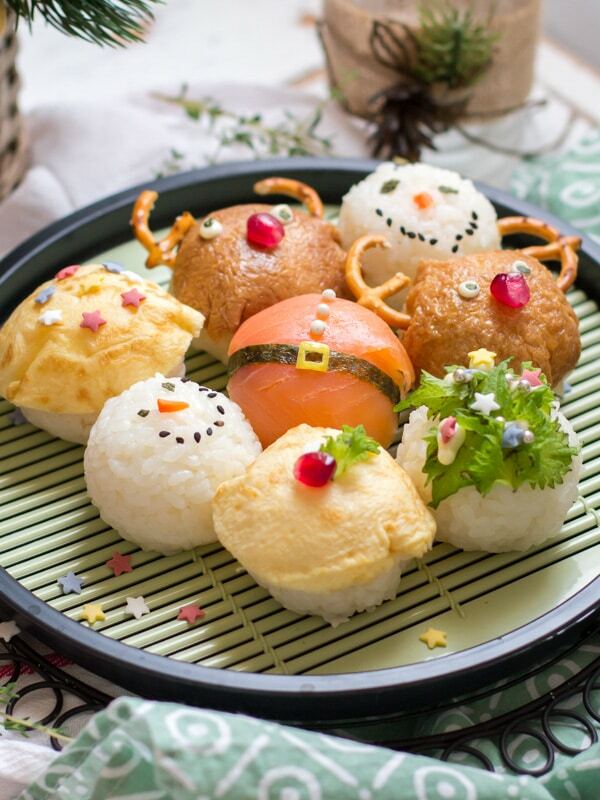 I made these sushi balls in October as well with a Halloween theme and they were just so cute and fun to make, so I thought I would make a Christmas version too. My favourite of the little sushi balls is Rudolph, he’s so cute and also tastes amazing; fried tofu (inari) is one of my favourite types of sushi! But make sure you take out his pretzel ears before eating because it might not taste too good with the sushi flavour. Ignore the snowman in the back, he’s melting a little. A lot of people in Japan eat sushi at Christmas but the main Christmas tradition in Japan is to eat KFC chicken for dinner. I don’t know where this tradition came from but every year when I go back to Japan, there are so many commercials from KFC and convenience stores like Family Mart that are advertising fried chicken for a Christmas feast. I’m not sure if anyone cooks a big feast at home to celebrate with all the family because Christmas isn’t really a big holiday in Japan. But they do like to eat Christmas cake and the fried chicken. We don’t really do a big Christmas celebration at home either, we just like to small lunch (not KFC chicken) so these Christmas sushi balls are going to be great! 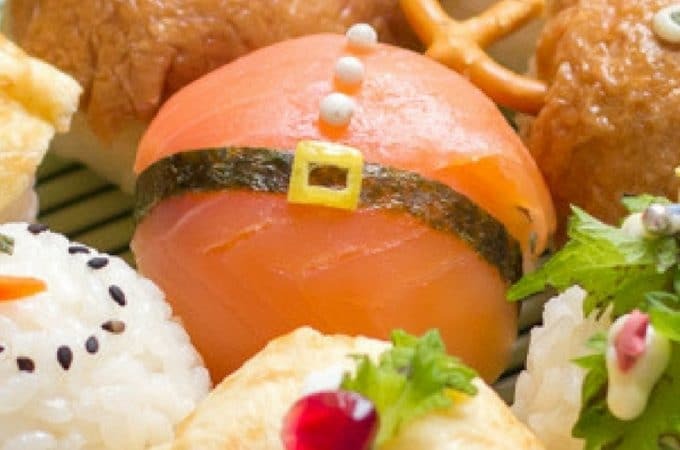 You can decorate them any way you like but if you want the same as us then you can use smoked salmon, a thin strip of seaweed, a little cube of lemon skin, and little silver bead cake toppings for Santa. For Rudolph, we used prepared fried tofu (ajitsuke inari), pomegranate for the nose, 4 tiny drops of mayonnaise and 4 little seaweed circles for the eyes, and pretzels for his ears. Then we used shiso leaves for the Christmas tree and thinly fried egg for christmas baubles, both topped with cake decorations. And then lastly, for the snowman we used black sesame seeds for his mouth, a tiny piece of carrot for his nose, and seaweed for the eyes. Some of the little eyes and other small parts are easier to attach to the sushi if you use forceps or chopsticks! I hope you enjoy making them at Christmas! These cute little Christmas Sushi Balls are fun to make and require little preparation so they're perfect for a last minute Christmas treat! You can use whatever toppings you like but if you want to do the exact same as ours then check out how we did it in the blog post. 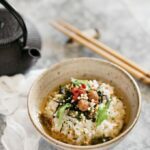 Cook the sushi rice as per your rice cooker instructions or in a pot. Before adding the water to cook the rice, mix in the dashi powder then pour over the rice. Once the rice is cooked, pour the sushi vinegar over it and mix to flavour the rice. Once the rice has cooled down a little, place your favourite topping in the centre of a piece of saran wrap. Place a little scoop of rice on top of the topping then seal it together with the saran wrap and softly squish and shape it into a ball. Continue to make sushi balls with various toppings then serve! The each different toppings are not included in the nutritional value. 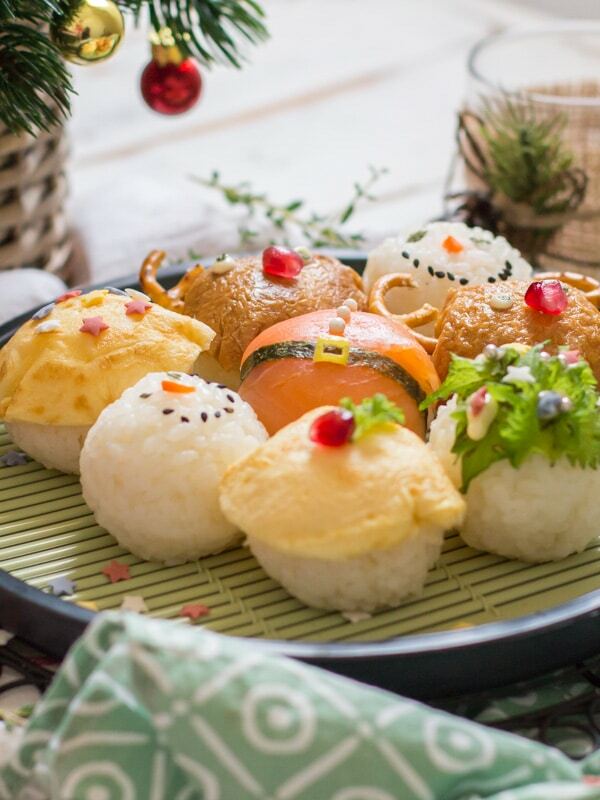 These are the most adorable sushi balls ever! The santa suit has to be my favorite one. You are brilliant! I am sure that these will be a huge hit at parties. Thank you Lockness 😀 Good thing about this Sushi is that you don’t need a sushi rolling mat. 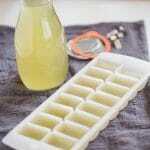 It only required your imagination and creativity:D.
Amaaaaazing and sooooo cool idea! Sushi is one of my favorite ”dishes” but the way you presented it, is so clever and I really can’t pick which shushi type is the best. So festive and funny… you nailed it! Thank you Krystallia, This type of sushi does not require rolling mats nor rolling skill 😀 Super easy to make and eye pleaser too. They look very festive! Great idea! I saw these yesterday on Instagram and fell in love – what a wonderful idea! Such a fun way to celebrate. 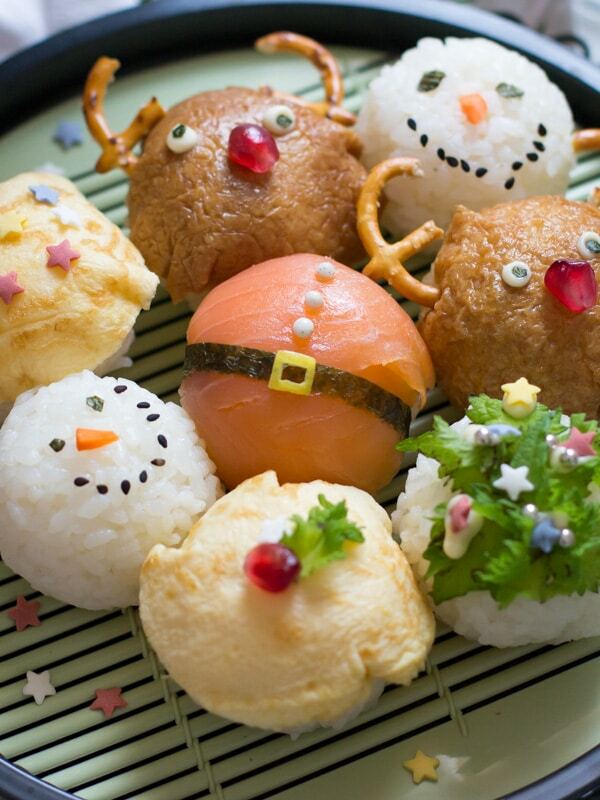 Like you, I’m a massive fan of inari so I think the reindeer would be my favourite of the Christmas sushi too! I have never seen such fun, beautiful sushi balls in my life! Amazing and so talented Shihoko! Just amazing. Pinned! Thank you Kevin 😀 It is fun to make and we definitely had fun to make and eat. Thank you for pinning too. These are just so creative and fun. Just looking at them puts a smile on my face. 🙂 Merry Christmas and happy new year to you and your family. Here’s to more great food and recipes! 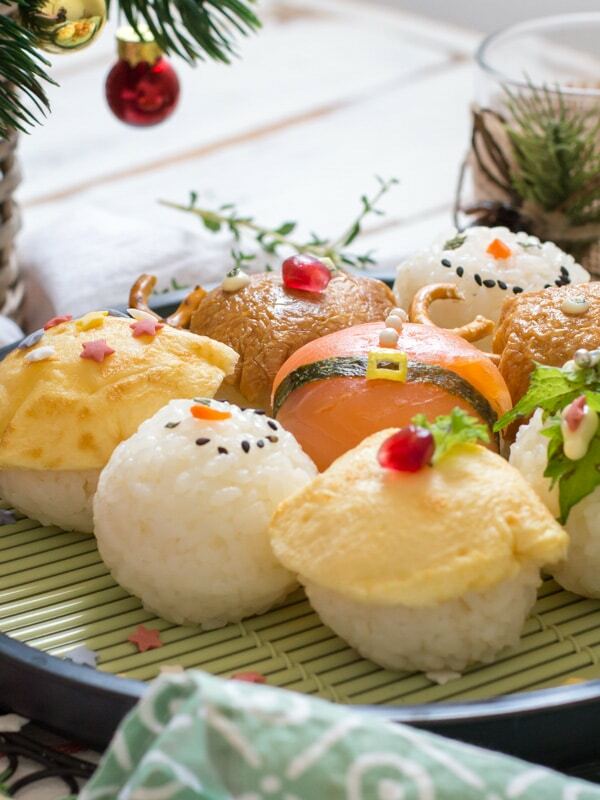 I love sushi balls, and these Christmas ones are so cute! These are so adorable! ANd what a great way to get little kids to try sushi! THese will surely be a hit! Thank you Michele, I am sure kids will love the sushi! Oh my gosh these are soooo cute!! You make the cutest food! OMG this is seriously the best Christmas idea EVER!!! And it combines my love of sushi and christmas all together! Soooooo super kawaiiiiiiiii! I love these! Pinned! !